As a Dulux Accredited Painter, I recognise the importance of a properly prepared surface and use Dulux premium products to give you a finish that looks better and lasts longer. Environmentally friendly products are used whenever suitable. You can expect to receive a properly prepared quote; fully explaining which methods best suits your individual needs. Carry a minimum $5 million public liability insurance. 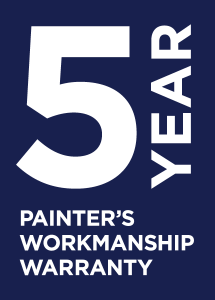 And my work is supported by the Dulux Accredited 5-Year Workmanship Warranty when Dulux Paints are used. 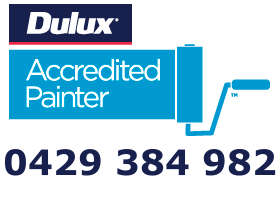 You can find out more about Dulux Accredited painters by downloading the enclosed brochure or by clicking on this link. All supported by the Dulux Accredited 5-Year Workmanship Warranty. For more information download the enclosed Once Consumer Finance brochure pdf. *Dulux Accredited Painters pay an Annual Accreditation fee. Dulux Accredited is used under licence. ®TM Dulux is a registered trademark and Dulux Accredited is a trademark of DuluxGroup (Australia) Pty Ltd.
** Terms, conditions, fees, charges and lending criteria apply. Credit provided by Once Credit Pty Ltd ACN 112 319 632 t/a MyBuy.